Another foraging toy from Planet Pleasures has bamboo that is shredded on the outside for added texture, coconut shell on top and bottom. The small has colorful corn cobs in the center while the medium and large have coconut fiber inside (AJ, the Galah aka Rosebreasted Cockatoo is enjoying the medium). When the fiber or corn cobs are shredded, use your imagination to fill it up until all destroyed! 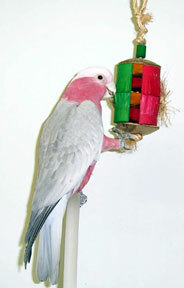 A great shredable toy for your Busy Beaks!